Somewhere towards the end of June I begin to realize what the near future has in store for me. My pants starts sticking to my legs, I sweat in the morning when putting on my make-up and I go to sleep wondering if the ceiling fan is really going to be enough or I need to turn on the A/C. Yes friends, I begin to realize its the summer. Oh and not just any summer. Its a Middle East summer. The kind that hits you unexpectedly and lasts longer than you can imagine (a good four months!). In this current situation you can either fight it or go with it, and I’m the type to go with it. (Fighting it means you are literally indoors all day with the A/C blasting). I try to relieve the heat by finding creative ways to cool off. I’m super lucky to have a pool in my backyard and thats my first stop to chill. But when I need to really find a way to cool off from the insides I turn to cold foods, freezing ones for the matter: Popsicles, smoothies, ice cream, frozen fruits, etc. 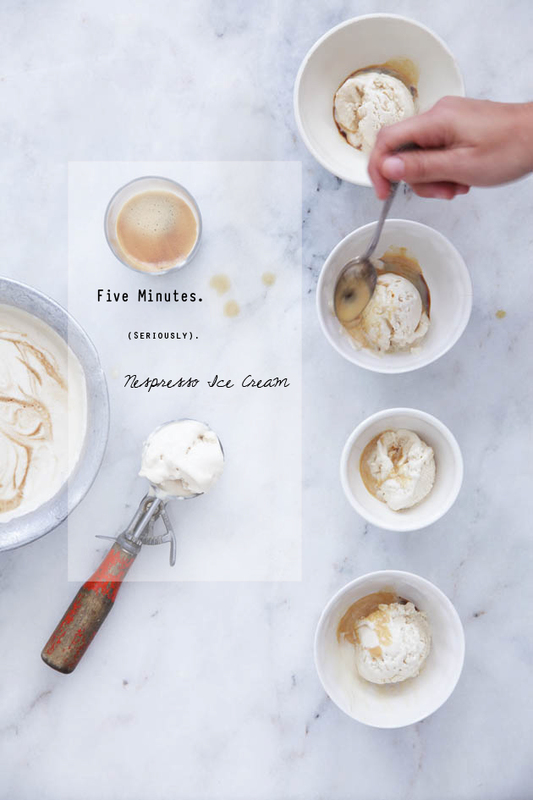 When we were asked by Nespresso to develop a summer recipe using their coffee, we knew right away that it would have to be a very cold dessert, and I recalled a recipe I had seen in an old-school Israeli cookbook that was 5-minute ice cream using sweetened condensed milk. So we got to work testing the recipe and we came up with the perfect solution to the Israeli summer. And if it works for our summer, its bound to do the trick anywhere around the world. For this recipe we used the Ristretto capsule; its intense roasted flavor proved to be a really nice match for the sweetness of the ice cream. It’s really important to whisk the heavy cream until it’s firm because once you add the coffee it will soften a bit. Make sure to add the coffee slowly into the mixer. 1. Using a mixer fitted with a whisk attachment, whisk the heavy cream until firm. 2. Slowly add the coffee while still mixing. 3. Fold in the sweetened condensed milk. 4. Pour mixture into a serving bowl, or into individual bowls and freeze overnight. 5. Serve cold, or with a shot of espresso (Affogato). *This post was sponsored by Nespresso. All images, recipes and content are ours. 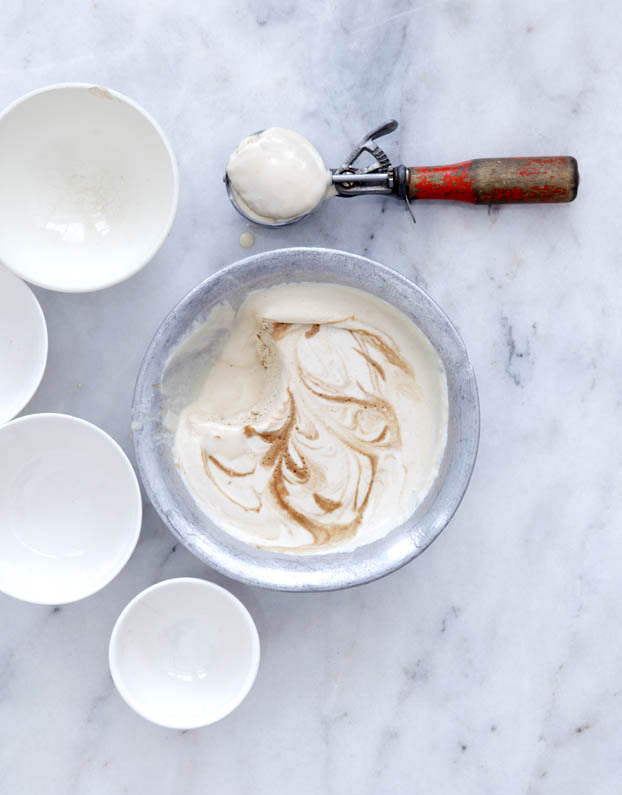 thanks for sharing another awesome recipe.. love how simplistic yet delicious the ice-cream is! definitely a recipe i will be recreating. thanks for the inspiration! a great deal of worth with us. Thanks for discussing those informations. Hi there, I found your blog over pinterest and was overwhelmed by its beauty. The picts are awesome, the style is phantastic, the whole impression is WOW!